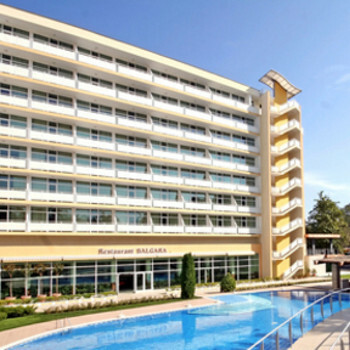 The luxurious modern Grand Hotel Oasis boasts a superb range of facilities and enjoys an excellent location in the very heart of Sunny Beach, close to many restaurants and shops and just 120 metres from the beach. Rooms are spacious and tastefully decorated. Having booked a Hotel room bed and breakfast, we arrived at 4.00am and were shown to our room. Imagine our surprise to have a one bedroomed apartment that was huge. Our room overlooked the pool area and was very clean and spacious. Boiler in the bathroom, make sure the switch is on for plenty of hot water. The safes our located in reception and cost 5 lev per day. Air con is free and temperature controls in the room. There is a hairdryer in the bathroom, although I prefer to use my own. Breakfast was okay, perfectly adequate. There was one small domestic toaster for the whole restaurant but this broke during our second week and wasn’t replaced by the time we left. Plenty of rolls and we tended to have a bacon roll. There were chocolate croissants, fruit, yoghurt and hot/warm food. We took our own tea bags and the hot water wasn’t always red hot but enough to have a cup of tea. If you have an apartment, take a kettle with you, as there is only a coffee machine supplied, although you can boil water in a pan on the two rings. There was a race for sunbeds and to be honest, there weren’t nearly enough for the amount of guests. At the end of our first week, a group of guests reserved 18 sunbeds by 12.30am on the Friday night and never took their towels off these beds for 3 days. A lot of guests complained about this and by the time we left, there were signs up that no beds to be reserved before 7.00am and all towels to be removed by 7.00pm. There were mattresses supplied for the majority of the beds. The pool was quite cold when you first get in, but once in, it was lovely. The only area of the pool where I could touch the bottom was around the bar area and the gentle steps but it sloped away quite quickly towards the middle of the pool. The 25m pool was a godsend to me and I managed to do my 32 lengths every morning in peace. Heaven. Someone asked me to check out the lifts for a large pushchair/wheelchair. There are two lifts in reception and quite large, 8 person maximum and a panoramic lift, 10 person maximum and while we were there, someone came in with a large wheelchair and there was more than enough room. We didn’t actually use the Venezia Restaurant on site, as we prefer a salad for lunch and from what I could see, it was mostly pizza or pasta on offer. Restaurants I would recommend. Jupiter Steak House from the pool area, turn right and walk about 200 yards or so down the road. You may well see Niko outside with a Mexican hat on. Fab steaks and food always hot. Good service and staff really friendly. Local spirits and mixers were two for the price of one all day. The owner of this restaurant also owned the China House, just around the corner and huge portions and good value in here too. Egg Fried rice enough for two people. Ask about this restaurant outside Jupiter and they may give you a ticket for a free drink. Malinas is just a bit further on from Jupiter for salads and lunch. Large beer 0.98 lev. Steak House Atol, along the main road to the traffic lights and turn right down towards the market area. Special offer was pizza with chips and a small beer for 7.50 lev. Local beer in here was 1.50 lev. Carry on down this road to Djannys but if you want an evening meal in here, get there by 7.00pm otherwise you will have to queue. This was our second visit to the Oasis in 3 years. Standards are excellent with cleaners working round the clock in shifts. Room was of a good size with ample storage,Sat.TV,phone, radio,double glazed windows,fully carpeted and best of all comfortable beds. Air conditioning is in rooms and bathroom comes with hair dryer, shaver point, shower/bath and clean towels whenever you wanted them. We found the staff to be very pleasant and no compaints from us about the service. There is a very large,if cold, pool but we saw people swimming at one in the morning so that didn't put them off. All in all a very good hotel and well recommended. ps. This hotel now has seperate apartments for hire for those going self catering and this could well be the best choice for anyone as there are loads of restaurants in the immediate vicinity. Really good hotel rooms very spacious and well furnished good double glazing, did not hear a thing when balcony doors shut. Air conditioning excellent couldn't have done without it. Excellent location within easy reach of everything. Breakfast was not fantastic, hot food was not covered so tended to be cold side. Great pool, the largest in the resort. Steak House (adjoining hotel) had live band every night but quite a wait for food. Italian restaurant very good. This is the second time we have visited Bulgaria and this is a far superior hotel than previous one we visited. It was right in the middle of sunny beach and 5-min walk from the main square. The breakfast was OK, with hot and cold food. Not a lot of choice but it was clean and nice. There was no evening entertainment but there are lots of bars around that you would not wnat to remain in the hotel anyway. Room was really clean and very big. Air conditioning and TV and minibar. Pool was realy large and lots of sunbeds that are free. The hotel was really nice and we would definatley go back to this one. Bulgaria can not be beaten on value for money. The hotel is excellent and well worth its 4star rating, dad and I had 2 huge single rooms adjacent to each other, the rooms were beautifully finished, and when the balony door was shut, you couldnt hear a thing. The minibar was excellent value, 36 lev for both rooms for the week including 3 phonecalls home, and we had softdrinks some booze and water every day from both rooms. It does say in the room folder that you will be charged for any damage to room or furnishings and fittings and costs each and every item, so I was careful about making sure makeup etc was off before getting into bed etc. We found the hotel staff to be quietly helpful, and very pleasant. The pool is big and beatiful and we had no bother getting beds, a member of staff goes round and takes towels of empty sunbeds. the pool bar is very reasonable and the steakhouse has a band every night. The breakfasts had plenty of variety of everything you can imagine and it all tasted good. The hotel its self was excellent very clean and lovely furnished large airy rooms. The pool was beautiful but the water was very cold. The only fault I found really was the food, some of the meats when you cut into them were far from cooked and also the food was only luke warm. Apart from that we had a very enjoyable holiday. If I return to Bulgaria I would go b.and.b. This is a excellant hotel, we had booked the continental then it was on holidays from hell, plus had really bad write ups on the internet. There was nine of us all together and the pool was lovely, looked like the bigest there in sunny beach,the rooms were large and slept three so we moved one of the kids in with us also to give grandparents a rest and still loads of room. Breakfast is good a mix of hot and cold. There is no entertainment but there is so much to do in sunny beach and its so cheap. The kids got scooters every day we went jet skiing,train,hired a bike that sat seven. peddelos on beach which is loverly sea is warm there were jelly fish but we saw know one get stung. Best of all we went on an of road adventure a new one this year the people were great we had a full day we were all shattered and bashed about kids loved it, it included two unspoilt beaches,dinner,as much quad biking,horse riding,shooting,target practice as u liked make sure u book this one as there r others. Where do I start??? 2nd visit to this hotel. Booked it again after a superb time in 2003. Arrived to find air conditioning in room didn't work. We reported it 3 times to reception before we were told that it was broken and a new part had to be ordered. It never arrived during our stay. Automatic glass door didn't work very well and on one particular day didn't open at all, causing me to walk into it. The glass cracked! I was telephoned by reception to collect the bill for the damage. The hotel were going to charge me over 500 Lev for the repair. They also withheld my passport and registration documents until the bill was paid. After speaking to the rep at the hotel, he spoke with the manager and the bill was reduced to 250Lev. Still over priced but I had to pay it. I know I was ripped off by this hotel as they said my insurance would cover it. After I filled in my complaint form through our Balkan rep, I was offered a bottle of wine as compensation from the hotel. Big deal!! I really can't fault anything about this hotel. Security safes - these are available at reception and I felt very at ease that nothing would happen my belongings. It cost 70L for the 2 weeks. You get a key and reception keep a key so both have to be present to open the safe. Breakfast - food was in abundance - all food was tasteful. Didn't have any of the pastries for breakfast though - to early in the day for anything that sweet! Rooms - the rooms were very comfortable and cleaned every day. Toiletries were supplied, towels changed each days also. TV, minibar, radio and hair dryer also available. Staff - very helpful and friendly. Always had a smile for you and spoke very good English. Exchange rates - I got 2.70L to the pound. I got 2.64 at my travel agents before I left. Remember you can't take Lev home with you so make sure you spend it or get it changed before you leave. Pool - the pool is quite large but need to be an early bird to get your towel out!! I always went to the beach so I can't comment on what the pool was like during the day.